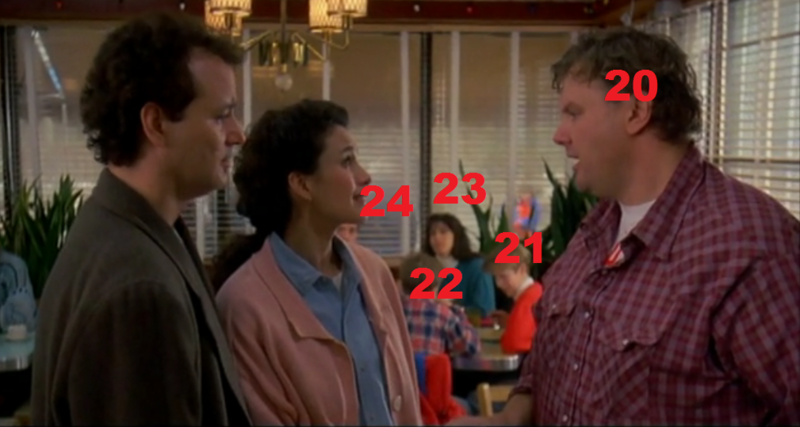 Here’s my attempt at a solution to the previous post on Groundhog Day. 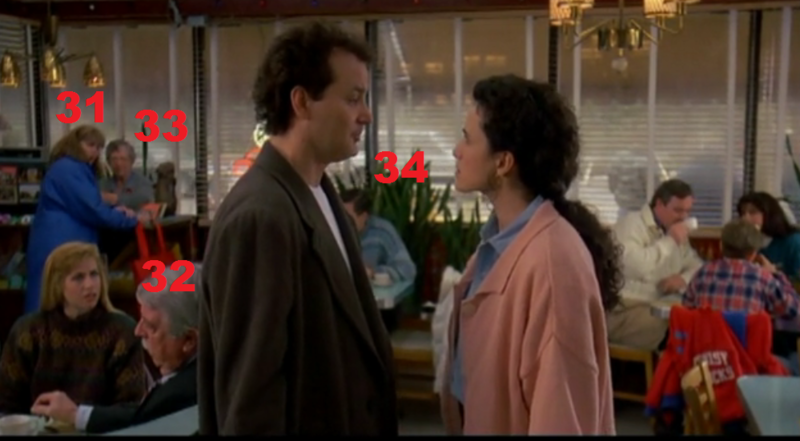 In order for Bill Murray (“Phil”) to convince Rita and allow for Rita’s peppering of questions, we have to assume that Phil knows everyone in the restaurant. It’s tough to get a beat on the number of people in the restaurant, but it’s a lot. I’ll start counting, but then we may have to fudge the numbers a little bit. So I count 34, plus a couple others not shown in the screen shots. I tried not to double count anyone, but if I did let me know in the comments. We can also assume there’s what? 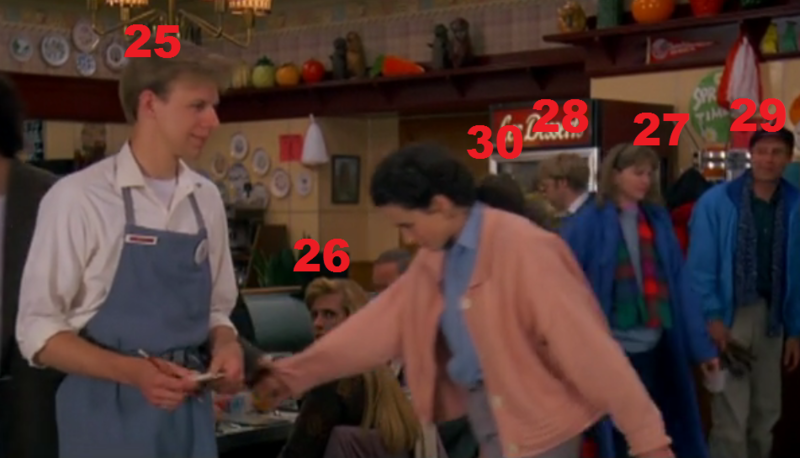 5-10 short order cooks in the back that Phil would have had to known equally well as the patrons. 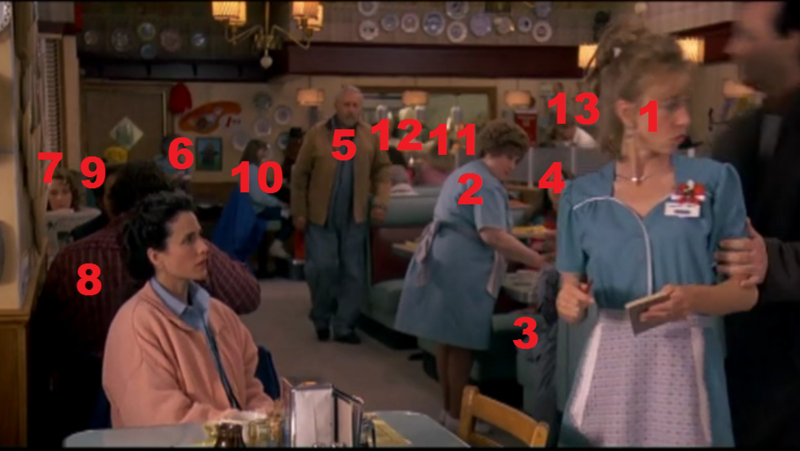 So my estimation is that Phil had to know details about roughly 45 different people in the coffee shop, not including Rita. Now I’m no cognitive scientist, but I’d be willing to bet it would take at least 2 or 3 meetings and conversations to acquire all the requisite information about these 45 people. Let’s say 3. 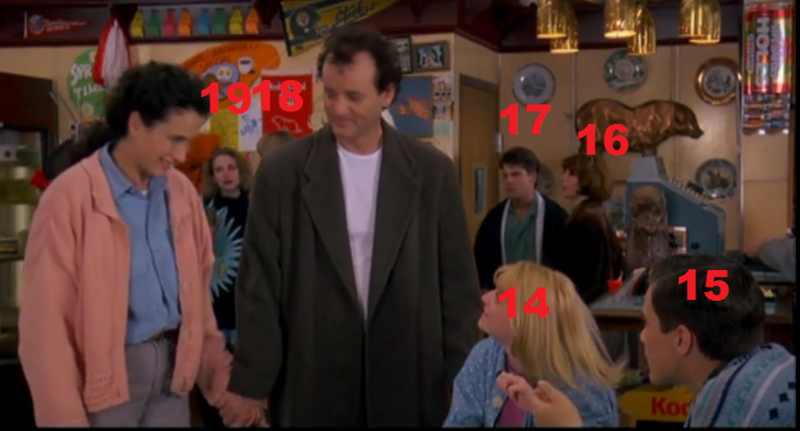 45 people x 3 conversations/person = 135 conversations = 135 days (?). And even if that seems like an overestimation, it’s probably unlikely that Phil ran into each of the characters on every replayed day, right? It’s probably more likely that he had an intimate conversation with a character one out of every three days on average, but it’s hard to know for sure. So I’d suggest this scene alone would require 135 days of “purgatory” in Punxsatawney. Anyone care to differ? Who is the author of the solution?